Mark Wahlberg with his valuable Air Jordan 4 Eminem x Carhartt sneakers. Some people collect comic books, some people collect wine. 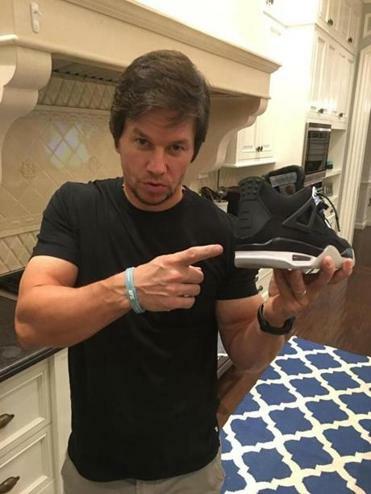 Mark Wahlberg collects sneakers. Like, collects. We’re not talking about a few dozen pairs of Air Jordans. Wahlberg, who’s made millions as an actor and producer in Hollywood, has a collection of kicks that’s to die for. We know because Wahlberg invited the nerds at the sneaker data site Campless to check out his stockpile of sneaks, and what they found is remarkable. Wahlberg’s footwear fetish is not exactly a secret: SoleCollector.com named him one of the Top 15 Most Legit Celebrity Sneakerheads and NiceKicks.com dubbed him the 2014 Celebrity Sneaker Stalker MVP. But Campless put a price tag on the 137 pairs of sneakers Wahlberg keeps at his house — he has more elsewhere, apparently — and the website estimates their value at more than $100,000. (Only 90 pairs were trackable, while the rest were unreleased or samples.) His most valuable kicks? Those would be the Air Jordan 4 Eminem x Carhartt ($22,755), the OVO Air Jordan 12 White ($10,000), and the Duckman Air Jordan 14 ($7,375). The collection puts Wahlberg in the upper echelon of celebrity sneakerheads, a group that includes Spike Lee, hip-hop star Wale, and comedian Jerry Seinfeld. “Mark is a fan of what we’re doing,” said Josh Luber, CEO of Campless, the Kelley Blue Book of sneakers. “Mark’s collection really isn’t all that big. There are people who have thousands of pairs. But there are very few people who have some of the sneakers that Mark has.” It’s true. Luber said 19 pairs of shoes accounts for two-thirds of the value of Wahlberg’s whole collection.